I may not be the connoisseur,I may not be the dream.I may not be the one you seek for,but..I have beaches you may have never seen. I loved him and he lived a grand life of 14 years! I have hardly heard people coming to Chennai for a vacation.Either they complain its very hot and humid which it is or they choose Chennai for a destination ahead to Mahabalipuram,Madurai or Ooty. 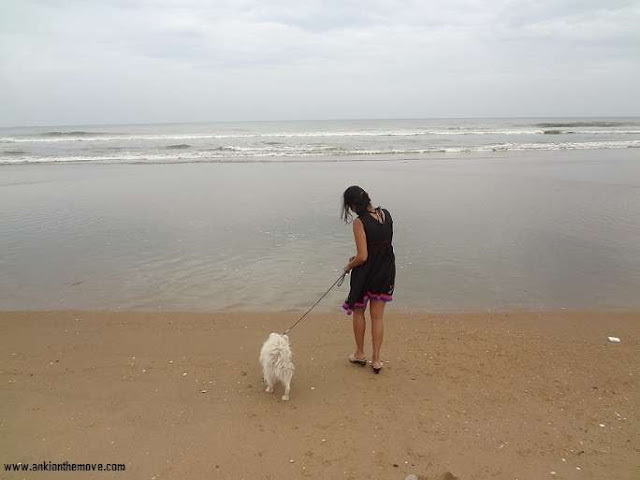 Having spent 1.5 years of my life in the land which isn't primarily what it is spoken about,I know the in and out and know that it's much more.The new developments make Chennai quite a livable place.The upcoming malls,the cafes and the clear beaches are a remarkable change from what It used to be. I walk in the sands.I walk in the sea.Is Chennai Smiling or Is it just me..! 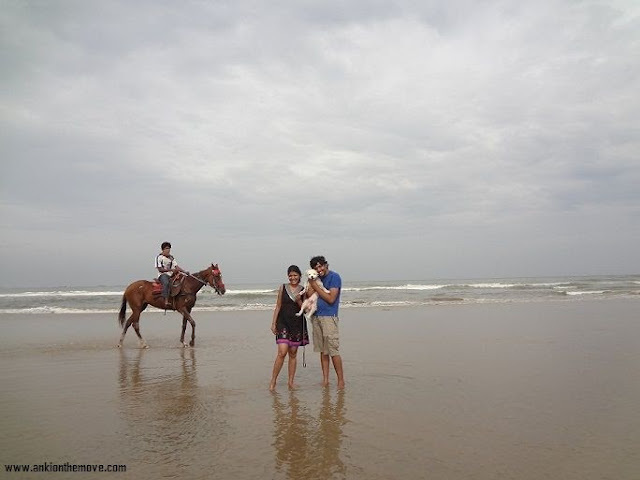 When it comes to travelling down South,people disperse to touristic spots i.e Kerala/Ooty/Kodaikanal/Kanyakumari/Rameshwaram. I have been to those places too as an excursion from Chennai.But is Chennai in itself self-sufficient? I shouted "I love my India" in full zeal oblivious of what was going around.After all,it was 26th Jan,the day I always feel patriotic.That "day" still remains in my heart.The warm morning breeze lifted up the sharp sunny sky,and there I was with my Tricolor.I didn't know if people would react,I didn't know if they would laugh.But I knew my love for my country. I can never guarantee that I might get the same hospitality as India anywhere else.But I can say as long as I am here I have support from my people sometimes even strangers.I know there are lot of loopholes,but we are improving.Cheers to India ! 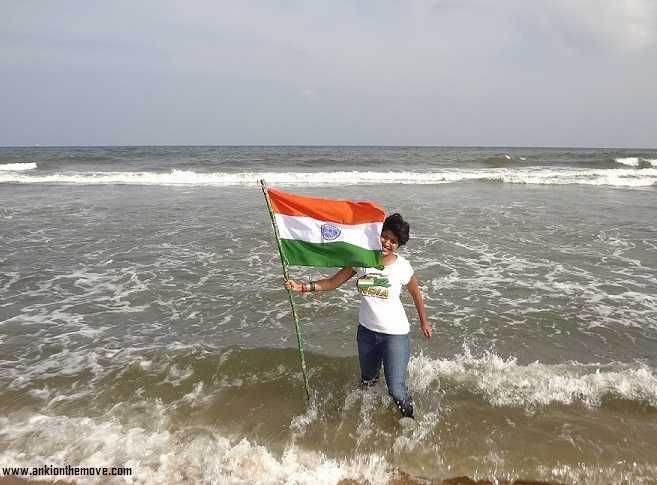 With this feeling of enthusiasm coupled with patriotism,I hold the flag high in the air with splashing water waves below my feet.Instantly,the small memories of childhood passed by.I still remember when we were small,we used to hold a small "Chota" flag or there used to be flag always on dad's Maruti on R-day.We used to sing together in Club "Bharat Humko..",and the claps always used to follow with humming with the rhymes. That one feeling of oneness,took the others by surprise.They came nearer,nearer to me with just a simple request "Can we hold the flag please".A small kid came and wished us "Happy Republic Day".It reminded me of my childhood. 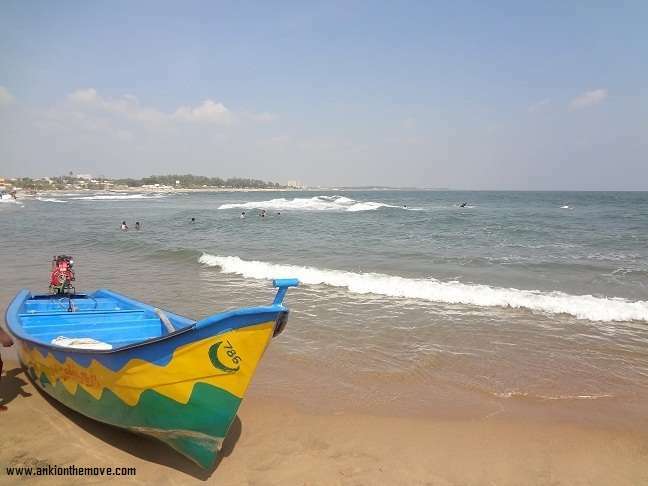 Sometimes my own feelings are so caught up,that I forget that Marina beach wasn't so wonderful long ago.I remember people telling me to avoid and choose Golden Beach instead.I remember holding my parents hand in Golden Beach in 90's and found it to be dashing then.How things change is a surprise! Marina beach has been wonderfully worked on.This beach is now clear and clean.The golden sands with a broad parking lot makes it an interesting place to be in the mornings or the evenings.Most of the times afternoon are blazing hot.Evenings are the best times if you enjoy some music,kites flying in the air,games and the local fishermen and of course,the beach. And the waves infatuates me.Those splashes,are always tempting.I have never been to a beach where I haven't gone in.This wasn't different. The marina beach is never overcrowded so you'll have enough space to sit or stroll around or even play volleyball. 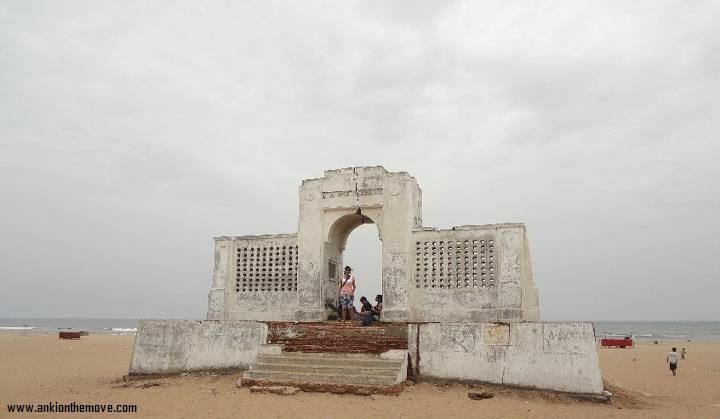 This is the story of Covelong Point, the first surfing village in India, and the story of one man, Murthy, a fisherman. No,it isn't edited. Didn't I say the water's blue? 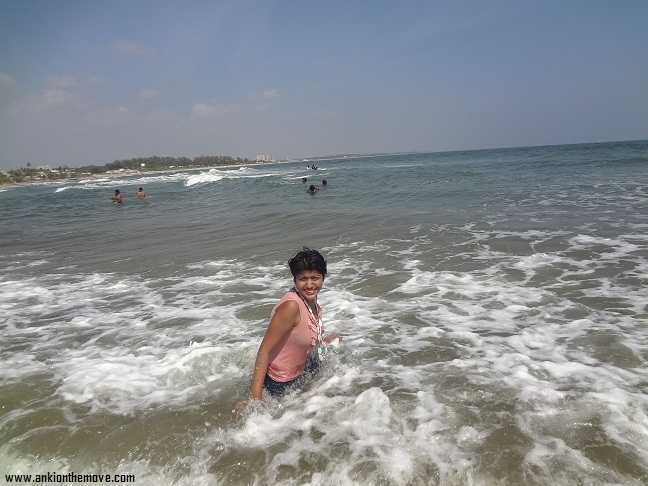 One of the finest beaches near Chennai is Covelong. Surprisingly the water is blue contrasting the water in Marina.The beach isn't overcrowded making it just the perfect beach for a family outing or with friends.And if you thought Covelong is not for you think again..
Because we have Surfboarding to add spice to the not-so-happening part of the city.I liked Covelong(Kovalam) beach in ECR more than the Kovalam beach in Kerala.I liked it not because I was living there,but because it was a peaceful,serene and blue atmosphere. 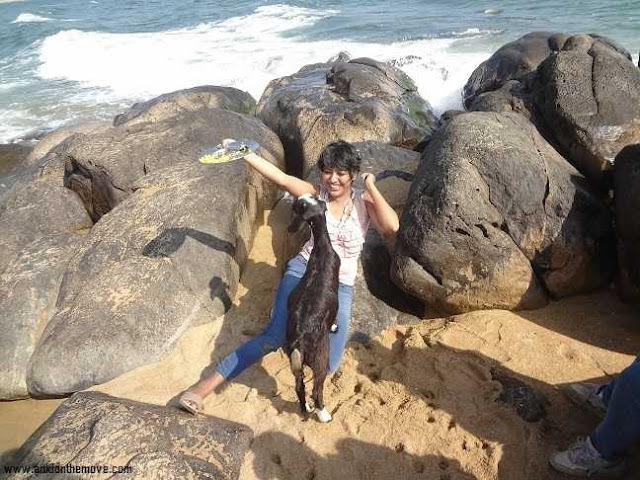 A beachy affair with a goat! 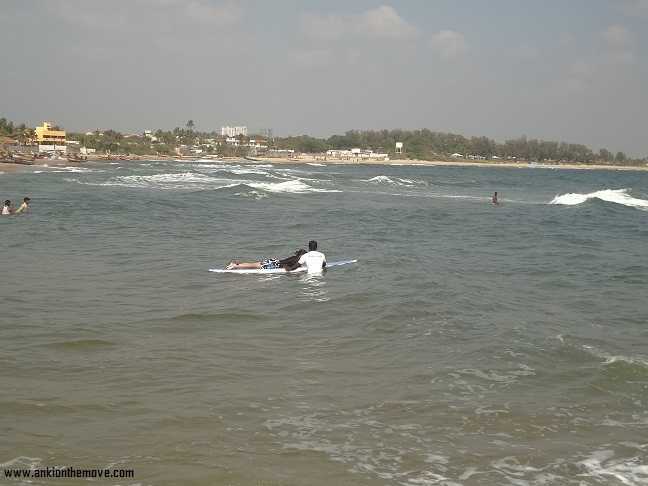 If you want to learn Surf Boarding come right here,they have certain timings when they teach(Usually morning 7am -1 pm).Even if you have no mind to try it,the beach is still very beautiful forming an arc amidst the rocks.We had great time taking bath and playing in the clean blue waters.Do not miss it if you are in Chennai. Tara rum pum pum Bathing my way out..! 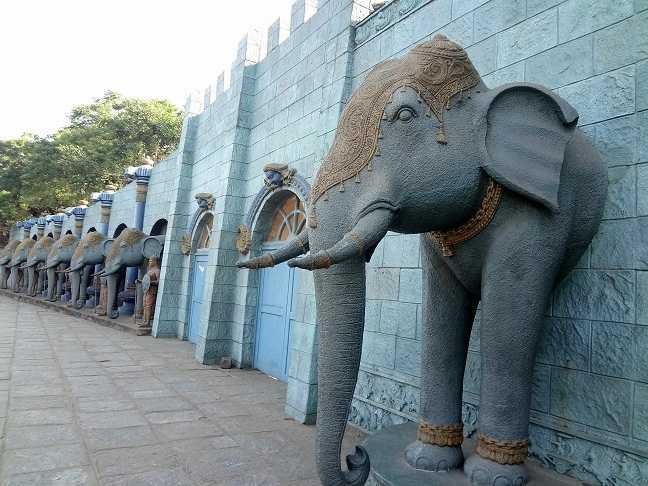 The carving on the wall with the Blue elephants present a royal splendor on the outside.Inside is the VGP Golden Beach Amusement Park with the views of the sea.I found this place to be a little more hyped.If you are driving down the ECR,stop by.If you ain't you wouldn't miss much. It isn't what you think it is..
Elliot's Beach form an end point to Marina beach.Also known as Besant Nagar Beach,this place isn't recommended for various reason.The beach isn't very clean as Wikipedia says,and there isn't much to do in the area. Tomorrow we discuss trendy cafes in Chennai,new Malls,new Gateways and more.. 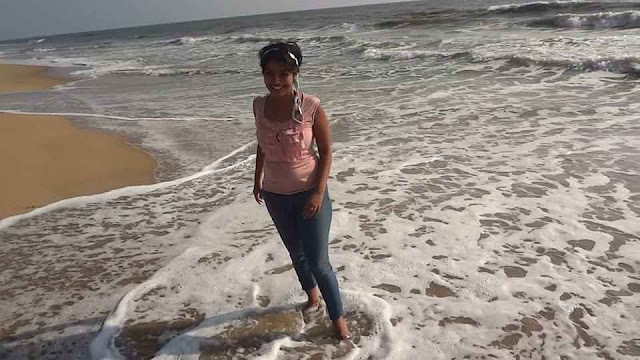 I had visited VGP Golden Beach in Chennai with my college friends for only once when I was pursuing my graduation that is really remarkable tourist place. Now I would like to go there again whenever I get time so, I recommend to all that at least should be go for once time in whole life.